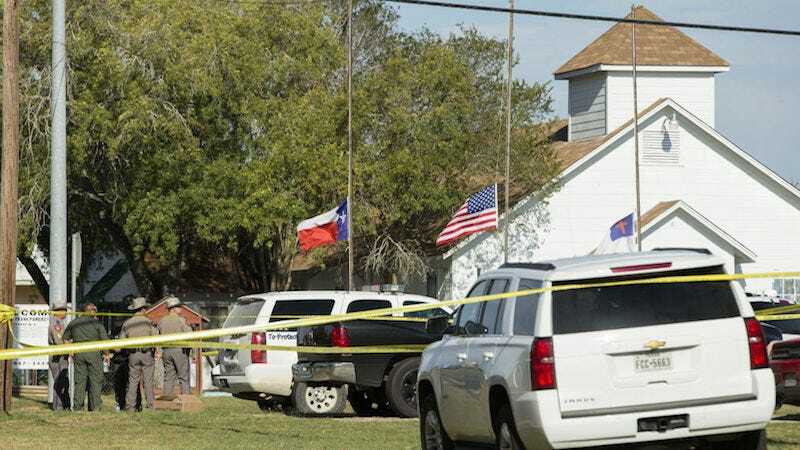 In the wake of the Sutherland Springs mass shooting that has left 26 dead, questions have been raised about shooter Devin Patrick Kelley’s ability to purchase four weapons between 2014 and 2017, in Colorado and Texas. Kelley, who was armed with three weapons during the deadly shooting, should have been barred from purchasing any weapons. In 2012, Kelley was court-martialed by the Air Force and convicted of domestic violence. He was sentenced to a year in prison for his attacks on his now ex-wife and stepchild, during which Kelley fractured the child’s skull and caused internal bleeding. The link between domestic violence and mass shootings is well-established but in this particular case, it appears to be more than a link, central instead to the deaths of dozens. On Monday, a former Air Force prosecutor told NPR that Kelley’s conviction should have triggered the Lautenberg Amendment, a 1996 act that ostensibly prevents convicted domestic abusers from purchasing guns. But Lautenberg is spottily enforced and its reporting requirements are loose enough that domestic abusers like Kelley can still obtain guns. Numerous outlets are reporting that, in this particular case, Kelley managed to obtain guns legally (the Ruger AR-556 he used to murder 26 people was likely purchased legally in a San Antonio gun shop) because the Air Force failed to report his conviction to the National Criminal Information Center database. Simply put, when the gun shops where Kelley purchased his guns ran a background check, his domestic violence conviction didn’t show up. The Washington Post reports that the Air Force’s failure to report Kelley is a violation of their own procedures. A scan of active records shows that the Department of Defense has just a single misdemeanor conviction for domestic violence on file with the National Criminal Instant Background Check System, or NICS. [The] military has currently submitted zero records for members subject to domestic violence restraining orders, the other category of domestic abuse that gets a civilian barred from buying guns from licensed dealers. But some states with populations in line with the military’s 1.2 million active service members have more domestic violence records currently on file with NICS. New Hampshire, for instance, has filed almost 14,000 records of such convictions. Alaska has 1,348 records of temporary protective orders on file. Some lawmakers have called on Defense Secretary Jim Mattis to review its methods of reporting, including Senators Kirsten Gillibrand (D-NY) and Richard Blumenthal (D-CT). Certainly, demanding better reporting from federal agencies would be a start, but there are still too many loopholes in our current patchwork of laws that allow domestic abusers to purchase and own guns.